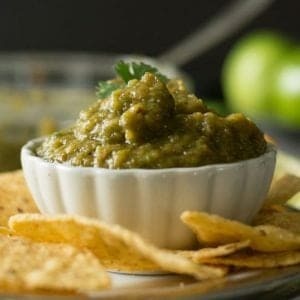 Healthy and flavorful roasted green tomato salsa is the delicious replica of our favorite Mexican restaurant’s dish. This is a terrific side and a great dip for any crispy appetizers. This luxurious savory sauce just stops you for a moment for its rich punch. This salsa is tastier than any store-bought salsa verde and I keep making it forever. The Mexican inspired recipe with the pantry staple ingredients. Made with garden fresh green tomatoes, jalapeno, cilantro, and garlic. Best to serve with tortilla chips or for the recipes which require salsa verde. Make sure you serve a big batch of appetizers when you serve this roasted green tomato salsa. 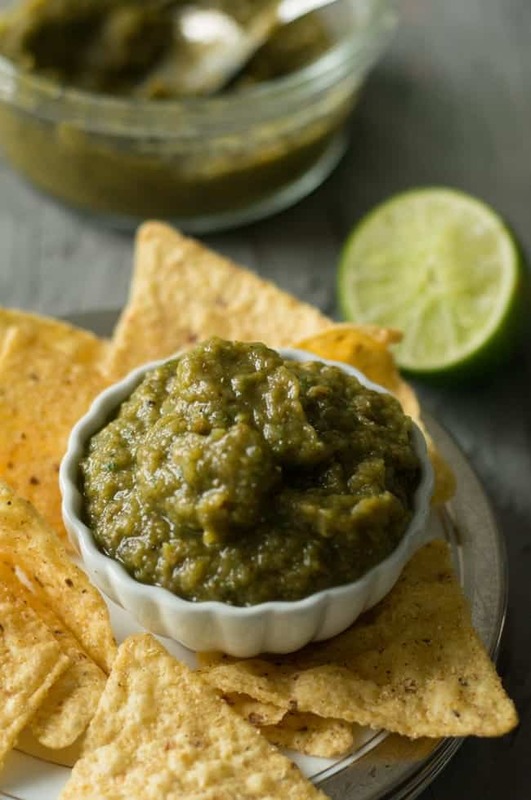 This roasted green tomato salsa is simple and localized version of Mexican’s salsa verde. Originally salsa verde is made from tomatillos(belongs to tomato family but covered with a husk). However, I always make salsa verde with green tomatoes as tomatillos are rarely available to me. If available they are pricey on the other hand. 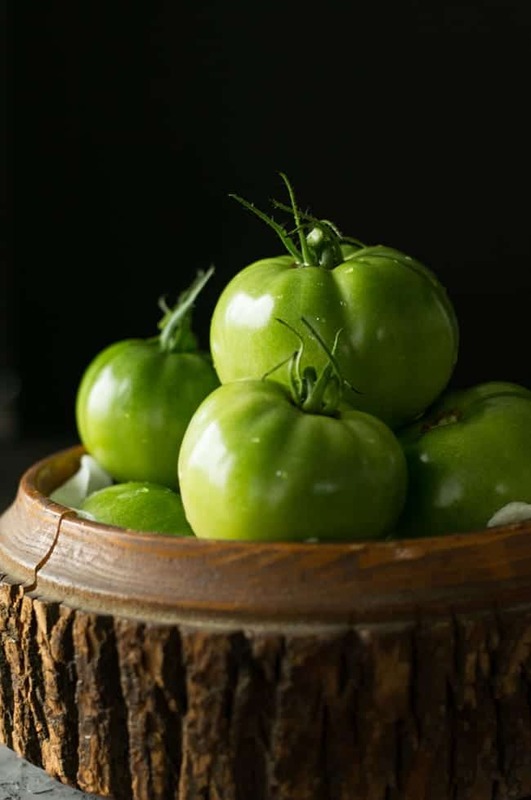 So making it green tomatoes is always budget-friendly and without compromising with the taste or flavor. I always serve an extra bowl of the appetizer when I make roasted green tomato salsa. As I cannot stop myself with the first serving of appetizer. If you try making this roasted green tomato salsa once, you will never look back to store bought jarred salsa verde. This is a tasty attempt to recreate my favorite dish from the local Mexican restaurant. This is one of the first few Mexican inspired recipes which I have customized successfully. If you are looking for other salsa recipes, you may look into homemade salsa or cranberry salsa. This roasted green tomato salsa tastes bright and refreshing dip. This is my precious summertime recipe, which I always wait to make. If you are a health freak and tortilla chips are not your choice, You may check this baked tortilla chips or you may throw this to any of your dishes to add a zing. You may store in the refrigerator for an entire week and use it whenever you crave. The temperature is almost touching low fifties here in Pennsylvania. And it is better to clear up all the backyards and to harvest the remaining vegetables whatever we have for this season. Getting them early is the best as the vegetables can get spoiled easily because of the cold weather. So I’m getting all the remaining vegetables from the backyard. For my surprise, I left with a big bag of green tomatoes. Now what? 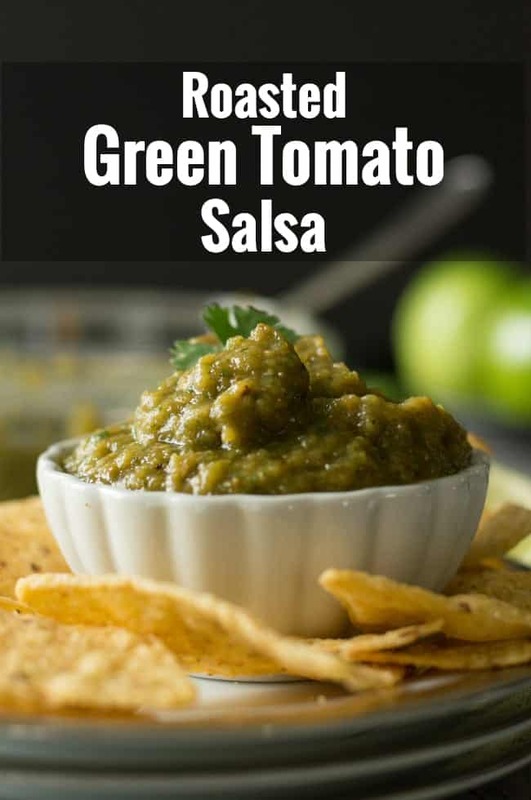 It is the time for me to make all my favorite green tomato recipes including this roasted Green Tomato Salsa. Getting vegetables from the garden is always fresh and healthy. Moreover, it does give you the satisfying feeling that you created a dish everything from the scratch. “Everything from the scratch” including the vegetables. I got this tomato plant from my sister in law, where she carried it from North Carolina to Pennsylvania. Due to the travel and vacation, I planted in the mid of summer. And this plant is giving me the enough of tomatoes than my assumptions. It is an extreme happiness to see a plant grow with its maximum potential. Coming back to this recipe, the roasting of garlic cuts down the raw and the pungent flavor. The same way roasting of tomatoes and onion cut down its raw flavor. And it maximizes the taste and texture of the roasted green tomato salsa. 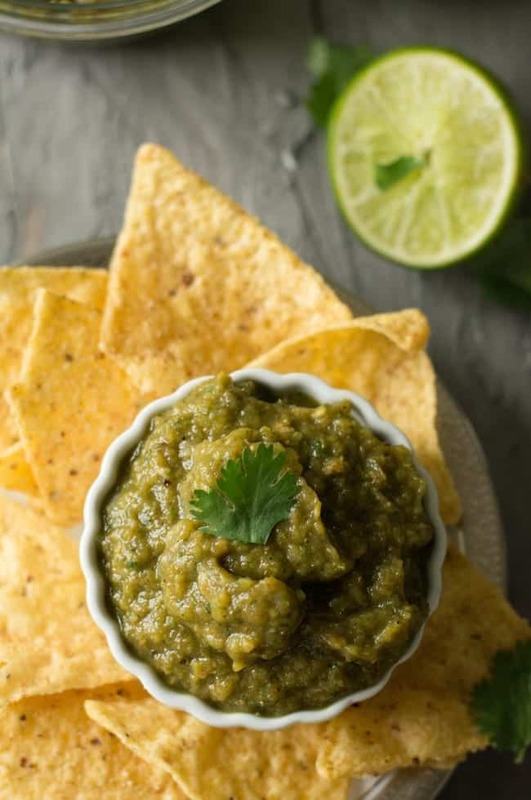 Lime juice and cilantro are the important ingredients to make this salsa super delightful. You may also use dried cilantro instead of fresh cilantro leaves in its absence. But wanted to tell you that fresh cilantro steps up the deliciousness of this salsa. Looking for variation? You may throw in avocado and make a creamy green tomato salsa. This is super tasty and healthy as well. 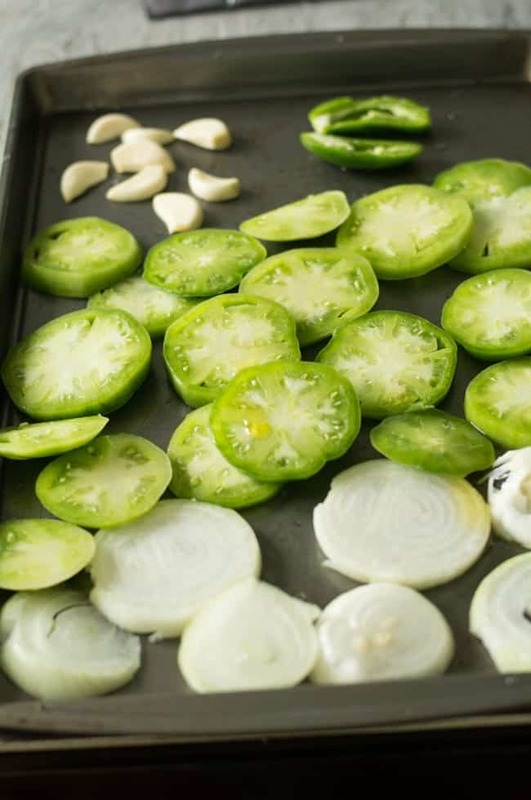 How to make roasted green tomato salsa? Slice green tomatoes about the half an inch thickness. If they are smaller in size then roughly chop into quarters or halves. Arrange the slices on the tray. Slice the onion for about the same half an inch of thickness. Do you need to peel the skin of the green tomato? You do not need to peel the skin of the green tomatoes. You can leave them as it is, it adds beautiful texture to the salsa verde. Cut jalapeno into the half. If you prefer the salsa to be hot and spicy, then leave the seeds on. Or on the other hand, deseed them completely if you cannot withstand the heat. I’m halfway in between, so left some seeds on the jalapeno. However, If I’m serving for game day, I will not deseed the jalapenos. As my family prefers a hot and spicy dip on game days. Leaving half of the seeds on the jalapeno will make the roasted green tomato salsa to taste perfect. Roast vegetables by keeping in preheated oven on 400 degrees Fahrenheit. Roast for 20minutes or until the edge of the vegetables turns brown. Let the veggies to cool. And transfer to a food processor or a blender. Add 2 tablespoon of lime juice, 4 tablespoons of chopped cilantro and salt. Gently pulse until it becomes course consistency. Adjust the salt and lime juice. Make sure you pulse at short intervals and always check in between. This will avoid any disappointments. The roasted green tomato salsa can become thin and watery like juice if it is not in coarse consistency. How long you can store roasted green tomato salsa? Store the leftover in a sealed container. You may refrigerate it for 3 days and freeze it for 3 months. What is the perfect consistency of salsa? The salsa has to be coarse in texture. Should have visible small chunks of tomatoes. And should be felt with every bite of salsa. Roasted green tomato salsa is the delicious replica of our favorite Mexican restaurant's dish. This luxurious savory sauce just stops you for a moment. This is tastier than any store-bought salsa verde. Slice green tomatoes, onion into 1/2 inch thickness. Slit and deseed jalapeno. 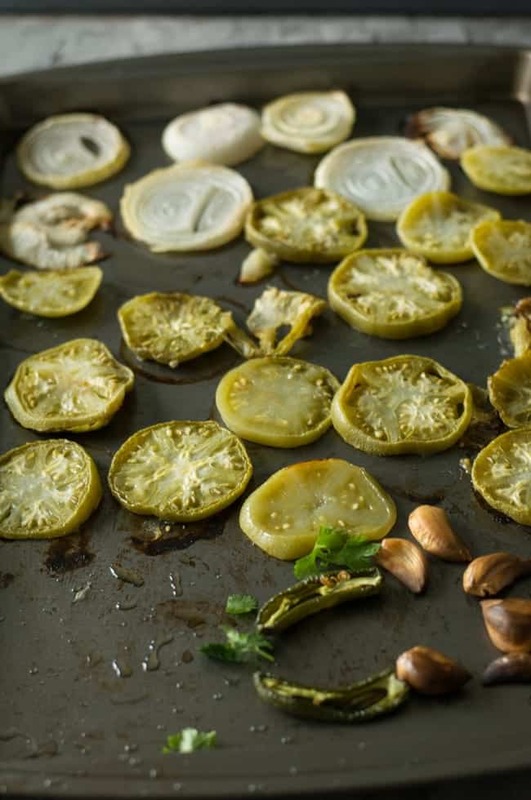 In a baking tray, arrange tomato, onion and jalapeno slices. And place peeled garlic pods. Bake it for 20 minutes or until the edges become brown. In a blender, add these ingredients, lime juice, cilantro, and salt. Pulse it until it becomes chunky. Transfer to the serving bowl and serve. Refrigerate it for 3 hours if you want to serve it cold.